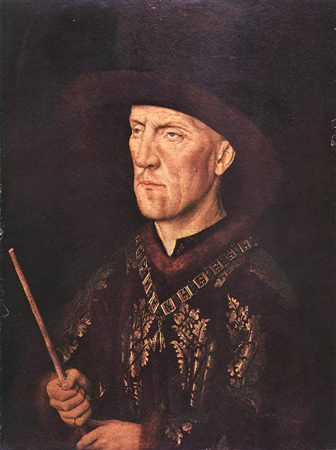 In May of 1425, Jan Van Eyck was appointed pour cause de l'excellent ouvrage de son mestier qu'il fait [On account of the excellent work in his craft that he made] to become a valet de chambre in the household of Philip the Good. He was promised an annual salary of "cliv p. monnoie de Flandres." Jan had held for the three previous years a similar position on the staff of John of Bavaria, the Count of Holland. On the death of John in 1425, Philip the Good was able to incorporate the County of Holland into his territories. At the same time he assimilated Jan Van Eyck into his household. From that year until Jan's death in 1441, Jan was paid a yearly salary by Philip. Jan Van Eyck as "peintre de monseigneur" was just like any other member of the court in that he served at the pleasure of the duke. The duke could appoint or dismiss any member of the court at his own discretion and that at his death the court would be disbanded. Court painters belonged to the "familia" of the sovereign. Bonds of reciprocal loyalty tied the duke to members of his court. 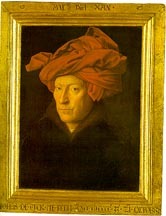 Burgundian records suggest that Jan Van Eyck was a particularly valued member of the court. In 1428, for example, when others had their pensions revoked, a special payment was made by order of the Duke to Jan. In 1435, the duke commanded the prompt payment of Jan's salary to help insure retaining Jan's services. He feared he would not be able to replace Jan with anyone so gifted in art and science. The familiarity between patron and artist is suggested by a couple of recorded incidents. In 1433, the duke made a visit apparently to Jan's studio in the Coudenberg Palace in Brussels to inspect unidentified works by Jan. The duke was designated as the godfather of child. In June 1434, a local goldsmith is paid on behalf of the duke for six gold cups to be given to Jan on occasion of the baptism. Philip the Good did not attend the baptism, but he sent the Lord of Chargny to stand in for him. In 1441, the Duke paid Margaret van Eyck a gratuity of 360 pounds or a year's salary after the death of Jan that year. Very dear and beloved, we have heard that you do not readily verify certain of our letters granting life pension to our well beloved squire and painter, Jan van Eyck, whereby he cannot be paid said pension; and for this reason, he will find it necessary to leave our service, which would cause us great displeasure, for we would retain him for certain great works with which we intend henceforth to occupy him and we would not find his like more to our taste, one so excellent in his art and science. Therefore, we desire and expressly order that, according to these wishes, you do verify and ratify our said letters of pension and have this pension paid to the said Jan van Eyck, all according to the content of our said letters with no further talk or argument from you not any omission, change, variation, or difficulty, as much as you would not anger and disobey [us]. For once and for all do so much that we have no further need to write. This we would only do with great displeasure. The terms of Jan's contract stipulated that he was paid for not the work he did but for his readiness to serve whenever he was called upon ("affin qu'il soit tenus de ouvrer pour lui [the duke] de painture toutes les fois qu'il lui plaira;" in 1427 "tant pour considéracion des bons et agréables services qu'il luy a faitz, tant au fait de son dit office, comme autrement, et pour l'aidier et soustenir et avoir ses nécessitez, afin plus honorablement il le puist servir." ) None of the works that have come down to us were made for Philip the Good. We know that Jan painted a portrait of Isabelle of Portugal as part of an embassy to Iberia in 1428-9 to arrange the marriage of the Portugese princess to Philip the Good. 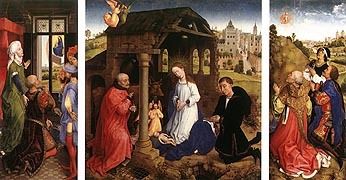 There is a reference to a "composition" Jan took to the Duke in Lille in 1434 and "certain great works" referred to in the 1435 letter quoted above. An Italian humanist, Bartolomeo Fazio, writing in his On illustrious Men in the middle of the fifteenth century, makes a reference to a circular map of the world Jan made for the duke. Besides these references, there is no documentary evidence of any panel paintings that Jan made for his patron. 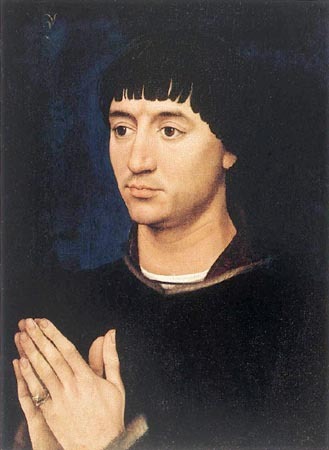 Except for a portrait of a member of the Order of the Golden Fleece, possibly Baudouin de Lannoy, lord of Molembais (c. 1388-1474), none of Jan's other works can be associated with members of the nobility attached to Philip's court. The Baudoin de Lannoy should be understood in the context of a tradition of dynastic portraits that can be traced back at least to the Valois dynasty in France with Jean le Bon. Baudouin de Lannoy, shown proudly wearing the collar of the Order of the Golden Fleece, commissioned the van Eyck painting to give visible testament to his status and that of his family. There is no documentary evidence of works now lost that were made by Jan for the higher nobility. With the exceptions cited above, we can not assume that Jan painted panels for the duke and the nobles associated with the Burgundian court. From wills and inventories it is clear that works collected by the members of the nobility were those traditionally associated with their patronage: tapestries, metalwork (gold and silver), and illuminated manuscripts. It is important to note the intrinsic value of the materials associated with these works. Inventories of the book collections pay careful attention to the costly bindings of these books. The frontispiece for Vasco de Lucena's Faits et gestes d'Alexandre (Paris, Bibliothèque nationale, fr. 22547, f. 1) subtly articulates the types of objects acquired by the nobility. The miniature by Loyset Liédet shows the author presenting the book to Charles the Bold who sits on his beautiful wood throne with its magnificent tapestry cloth of honor dominated by gold and blue embroidery. The canopy above bearing Charles' identity [Charles par la grace de Dieu Duc de Bourgogne] enframes both Charles, wearing an elaborate jewelled collar, and the sideboard full of gold and silver vessels. Liédet even calls attention to the book as a material object with its studs and clasps and gold foredges. It is the furniture, jewelry, tapestries, gold and silver plate, and books, all carefully delineated in this miniature, that were important markers of noble status. 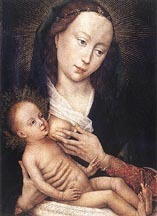 The pre-Eyckian examples of panel painting in Bruges are relatively meager. Certainly works have been lost over time, but there is no evidence for a strong industry in panel painting before the time of Jan van Eyck. There was probably a painter's guild in Bruges from the middle of the fourteenth century, but what type of paintings were produced in this industry? We should remember the Maelwael family in Nimegen. 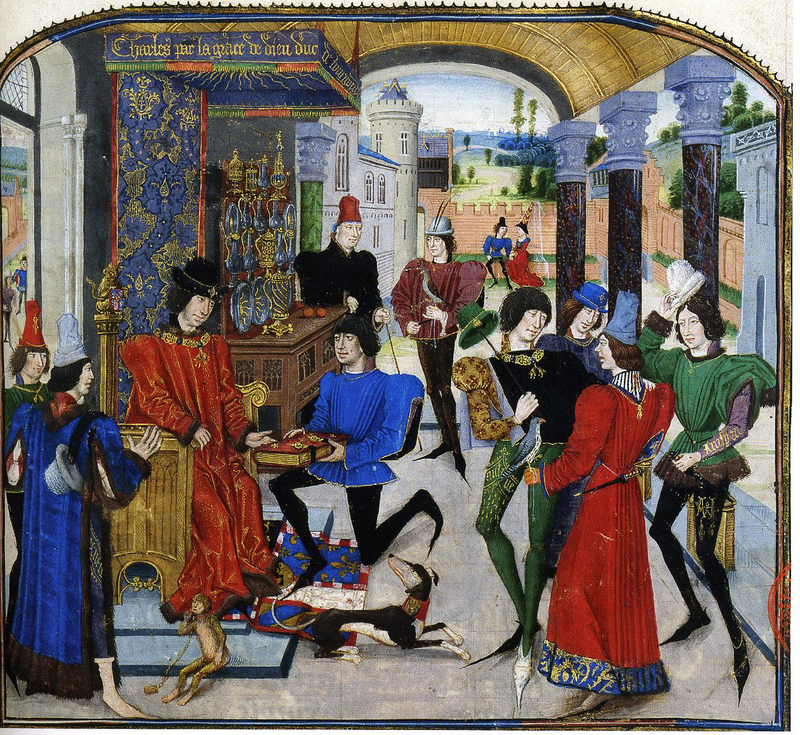 The grandfather and great uncle of the Limbourg brothers had productive careers painting the decorative trappings for the court of the Duke of Guelders. This would likely be the staple for the painters of Bruges in the pre-Eyckian era. It is likely that the majority of the works that van Eyck did directly for the duke would be in the category of objects that we would label as decorative arts and ephemeral things made for particular court festivities. The records that have come down to us indicate the court painters were regularly called upon to paint saddles, banners, etc. with the arms and devices of the aristocrats. Philip the Good was a very active renovator and builder of his palaces, and account records list payments made to van Eyck at particular estates. This suggests the possibility of his involvement in the interior decoration of these residences. The Burgundian court was reknowned for the extraordinary magnificence of its display in different festivities. Again these could have been projects van Eyck was called upon to contribute to. Jan van Eyck, Rolin Madonna. Nicholas Rolin was the Chancellor of the Duke of Burgundy from 1422-1457. Rogier van der Weyden, Beaune Last Judgment (exterior) Nicholas Rolin in prayer in the left panel. Jean Chevrot was the president of the grand conseil of the Duke of Burgundy and the Bishop of Tournai. Jean Chevrot is the bishop administering confirmation. 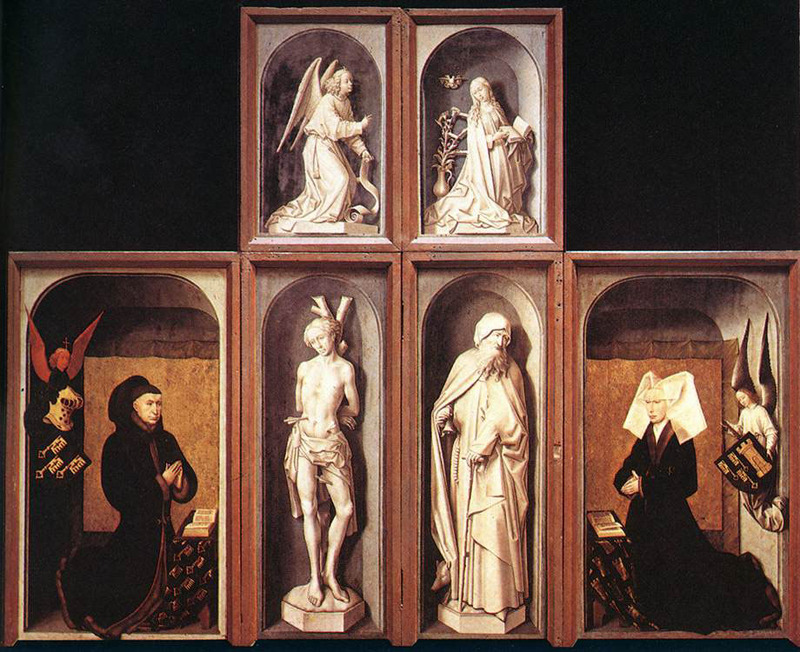 Rogier van der Weyden, Bladelin Altarpiece, Peter Bladelin is shown in prayer in the central panel. A councillor and financial official to Philip the Good. He would later be the maître d'hôtel under Charles the Bold. Bladelin was the founder and lord of Middleburg. According to Chastellain, Bladelin received an annual income of 6,000 gold crowns in rents alone. 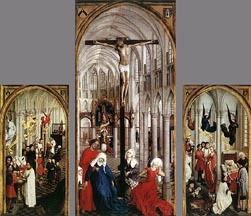 Rogier van der Weyden, Jean Gros III Diptych, c. 1450-60. Jean le Gros was the audiencer for Philip the Good. 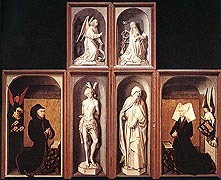 Rogier van der Weyden, Braque Triptych. Perhaps commissioned by Jean Braque's wife, Catherine, after his death. 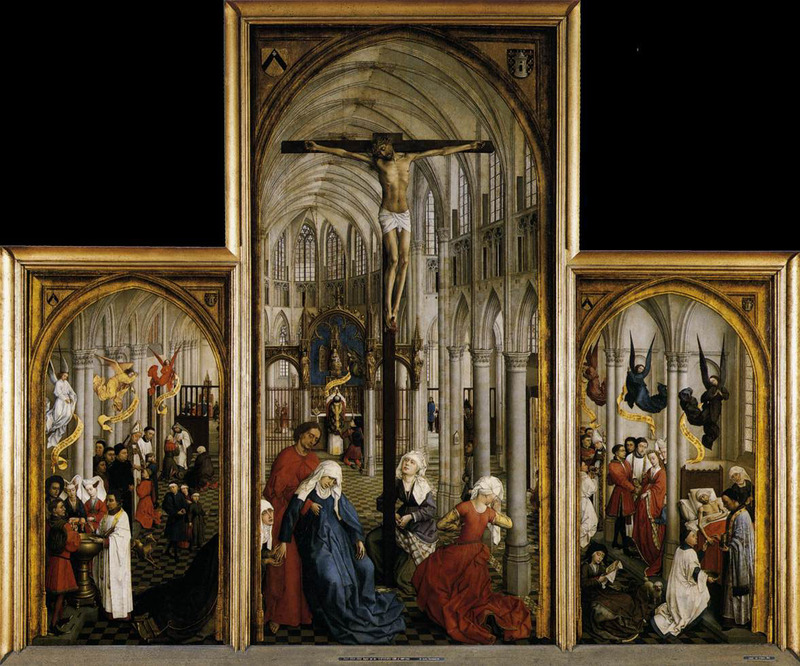 It has been traditional to associate the invention of oil painting with Jan van Eyck. 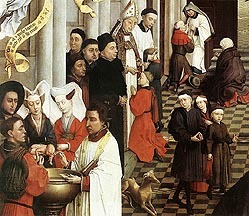 While it is clear that the basic techniques of oil painting were known earlier, it can be argued that Jan van Eyck popularized the media by connecting it with the interests of a particular social class. While not having the intrinsic value of objects collected by members of the nobility, the oil paintings of van Eyck through mastery of light and attention to detail had the semblance of the costly furs, fabrics, jewels, metalwork, etc. associated with noble patronage. The magnificence of the objects depicted in works like the Rolin Madonna clearly appealed to the audience of bourgeois functionaries who had learned to measure importance through material display. It has been noted by scholars like Harbison that it is not a coincidence that oil painting emerged at the same time as the emergence of the bourgeois functionary class. 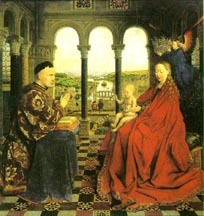 The positioning of the inscription on the back wall, the statement of Jan van Eyck's presence in this chamber, and formal script associated with official records, all suggest the role of Jan van Eyck as a witness to this event, but as in the case of the baptism of his own child when the Lord of Chargny acted as the surrogate for Philip the Good, it seems likely that van Eyck's role as witness was on behalf of the duke. 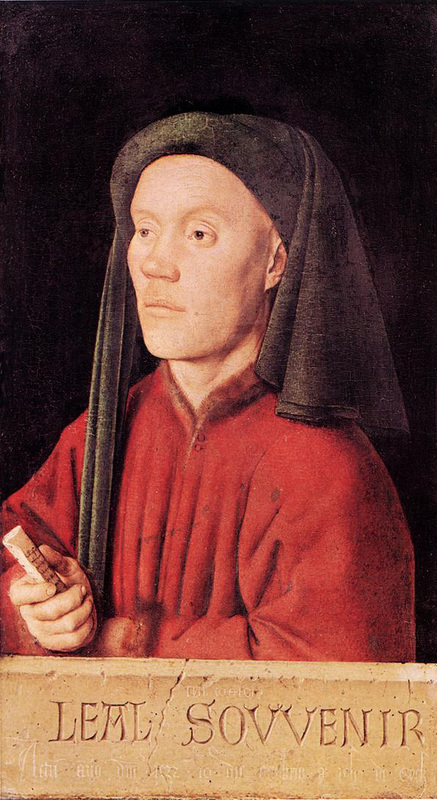 As the court painter, Jan van Eyck would have been exempt from local guild regulations. At the same time the guild would be sensitive to abuses of this exemption with having court artists work for private individuals outside of the context of the court. 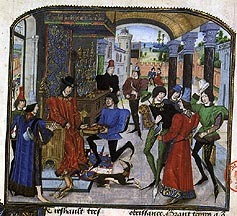 A later dispute between the Bruges painter's guild and a court painter Pierre Coustain makes this clear. Coustain could make paintings for the duke and for princes, barons, and officials in the ducal household ("messeigneurs les princes, barons, et officiers de son hostel") (Wilson, Painting in Bruges, p. 67), but it would be breach of guild rules for him to produce paintings outside of the context of the ducal household. The inscription at the bottom of the parapet of the so-called Thymotheos painting in the National Gallery also suggests the context of official court documents. It reads: actum anno domini 1432. 10.die octobris a jan de eyck (Done in the year of the Lord 1432, the 10th day of October by Jan van Eyck). The specificity of the particular day enhances the legalistic aspect of the inscription. Like the Arnolfini signature, the script used here can be connected to court documents. As discussed in the web-page introducing the court of Burgundy, the London panel is probably a portrait of the Burgundian court musician Gille Binchois. 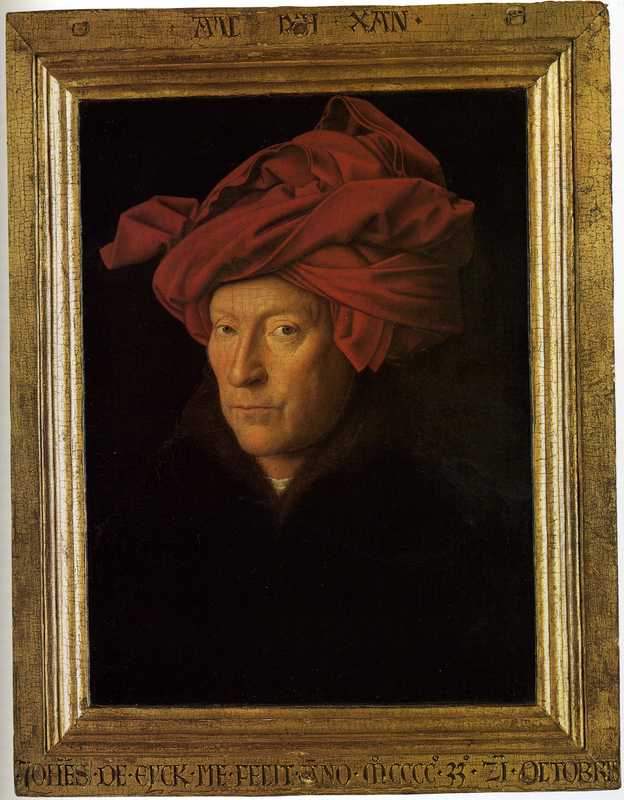 While not a self-portrait of van Eyck, it is important to see this painting as a representation of a court functionary like van Eyck. The appearance of the motto Als ich can [as [best] I can] on the upper frame can be associated with the practice of using mottoes by the nobility. The inscription on the lower frame (Iohes de Eyck me fecit anno MCCCC33 21 Octobris) has the same specificity of dating as in the Thymotheos portrait. Such signatures and mottoes found in van Eyck's works are clearly exceptional in early fifteenth century panel painting. 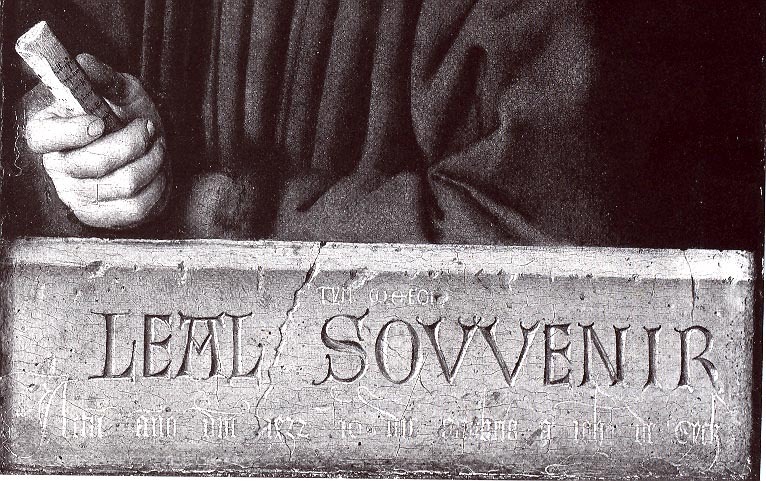 Neither Robert Campin or Rogier van der Weyden employed this type of inscription. The inclusion of the signatures and mottoes suggests that they are part of van Eyck's design to articulate his privilege as court painter. He could be like a court official and witness events and produce documents that have ducal sanction. 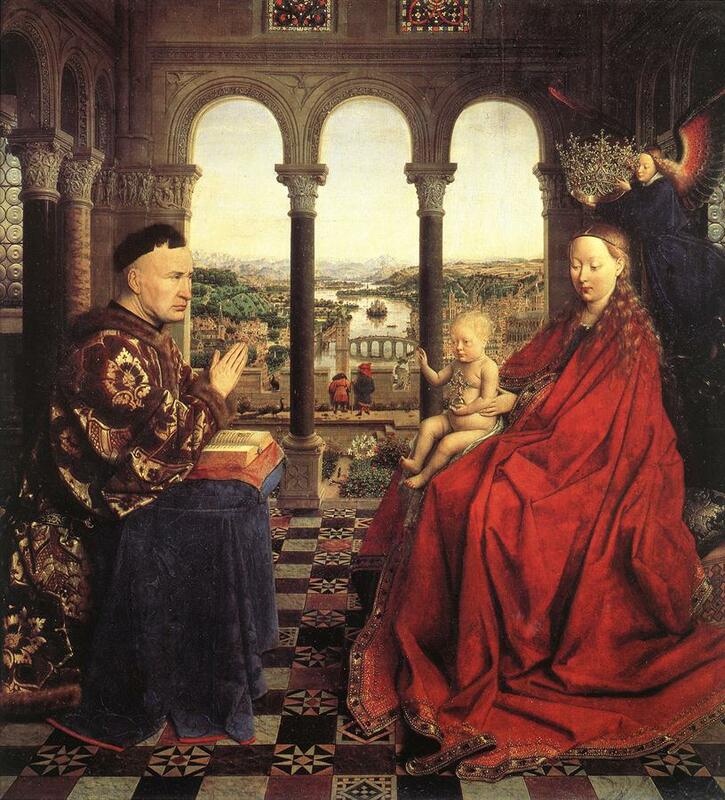 It is also possible that van Eyck is making a claim for a change in social status. One of the rewards sought after by bourgeois functionaries attached to the ducal court would be gaining noble status from the duke in recognition for their loyal service. While, as we noted above, the works of Jan van Eyck had little intrinsic material value unlike works associated with the patronage of the nobility, the prominent inscription of these works by the duke's official court painter carried significant cachet for their original owners. These works are thus critical milestones in establishing oil painting as the work of individual artists as the dominant art form in the early modern period. 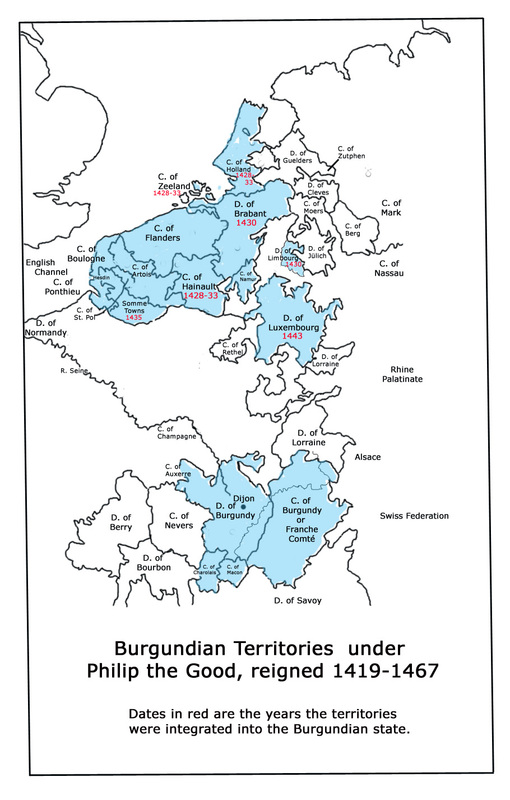 The Dukes of Burgundy were clearly aware of the importance their court as a sign of their prestige among the other princely powers of Europe. Georges Chastellain, the official chronicler of the Duke of Burgundy would later state "After the deeds and exploits of war, which are claims to glory, the household is the first thing that strikes the eye, and that which it is therefore most necessary to conduct and arrange well." [Georges Chastellain, Oeuvres, ed. Kervyn de Lettenhove (8 vols., Brussels, 1863-66) V, p. 364]. 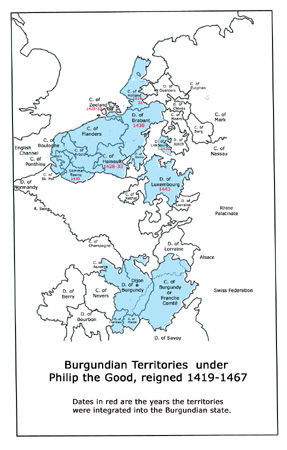 As we have noted in the introduction to the court of Burgundy, the Dukes saw their ambitions in broader historical contexts. The fascination with Alexander the Great revealed in their patronage demonstrates their ambitions to be compared to this great ancient model. 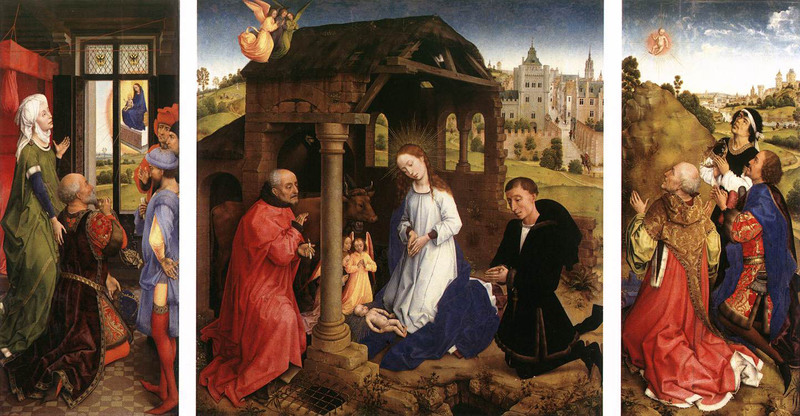 This interest further enhanced the status of individuals like Jan van Eyck. The comparison was made between the court of Alexander with his painter Apelles and the court of Philip the Good with his painter Jan van Eyck.